Destini has bad asthma and this fall/winter season has been a season of a lot of colds and upper respiratory infections as she just started pre school. When a kid with asthma goes through a period like that they get asthma attacks pretty frequently as well. I always want to keep tabs on her oxygen saturation from before and after we give her a breathing treatment but, it is difficult to do in the middle of the night. 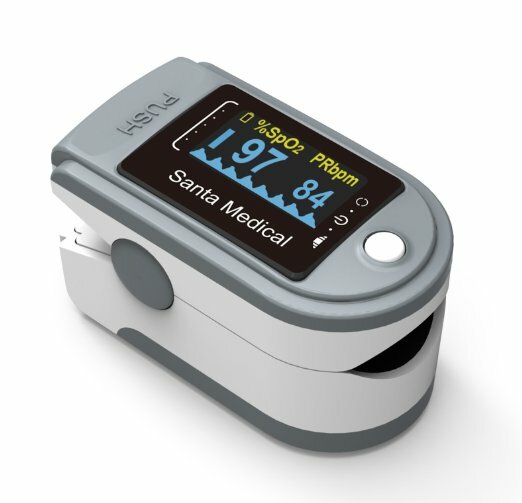 I was fortunate to review this Santa Medical Pulse Oximeter and be able to try it out with her. I took her to the doctor and showed them this and I used it right after they used theirs and the readings were both identical. So I know it works right. The doctor told me to use it before she had a breathing treatment and then to check again about thirty minutes after and if her pulse ox was over 92 that it was ok to continue treatments at home, if it was below 90 that we should go to the hospital and if it was below 85 we should call an ambulance. WOW!! What a powerful tool to have at home to keep tabs on a child who has breathing problems. I feel so much more secure in the decisions I need to make to take care of her now. The numbers are very clear, easy to read, and large enough that I can see them even bleary eyed in the middle of the night. The Santa Medical Finger Pulse Oximeter works great! This would be a nice to have in your medicine cabinet at home or in your first aid kit. You can use it to check the status of anyone who is having any kind of emergency and instantly know exactly how URGENT their breathing is. This gives you a quick reading of your oxygen saturation and pulse. This pulse oximeter comes with a lanyard and a nice little black canvas case, which is small enough to even take with you if you need it. I like that you can pick which way the display reads. If you are taking your own reading you don’t have to look at the reading upside down. A pulse oximeter is not just for medical purposes. They are wonderful to use during or after a workout to check your actual pulse. The machine couldn’t be simpler to operate. You just insert your finger and press the button and in a few seconds you have your reading. The meter will keep updating until you remove your finger. It does have an automatic shut off so that when you remove your finger it turns itself off. I love it! If you have any reason at all to have this kind of information, asthma, sports team coach, someone on oxygen therapy at home I strongly suggest this Santa Medical Pulse Oximeter!